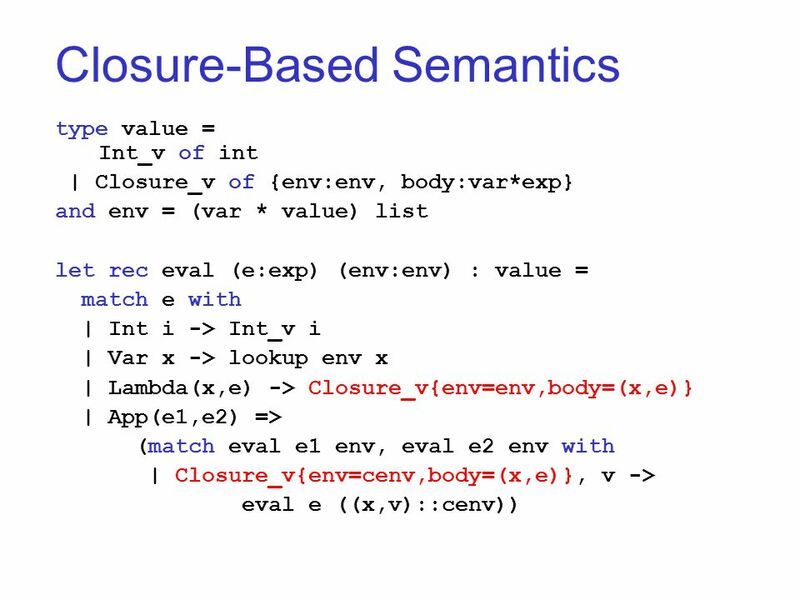 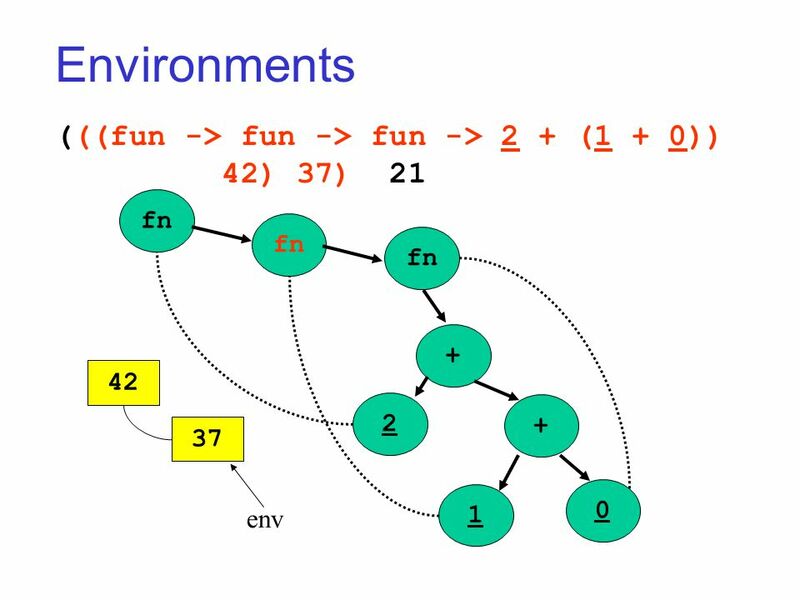 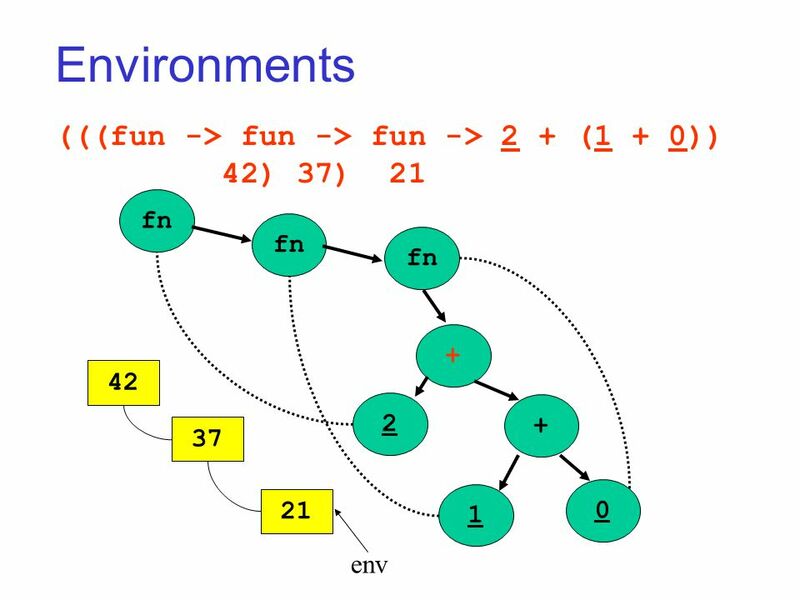 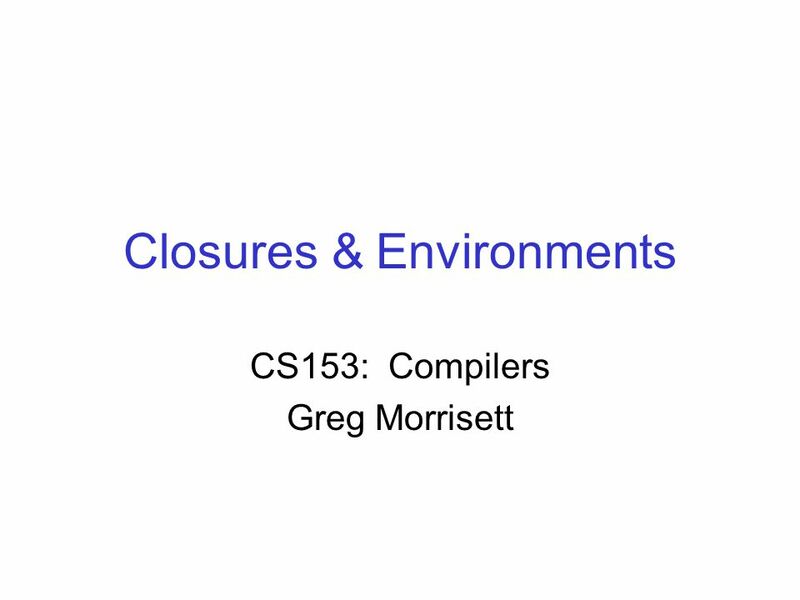 Closures & Environments CS153: Compilers Greg Morrisett. 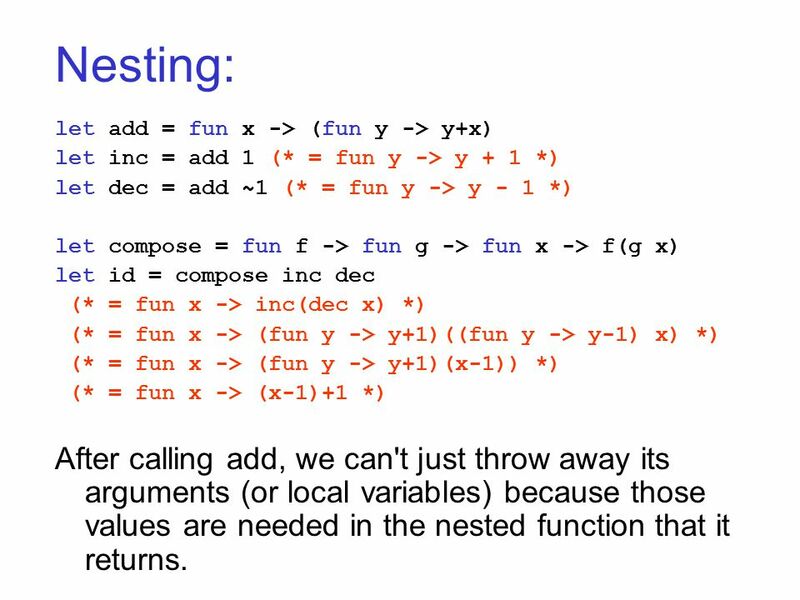 3 Nesting: let add = fun x -> (fun y -> y+x) let inc = add 1 (* = fun y -> y + 1 *) let dec = add ~1 (* = fun y -> y - 1 *) let compose = fun f -> fun g -> fun x -> f(g x) let id = compose inc dec (* = fun x -> inc(dec x) *) (* = fun x -> (fun y -> y+1)((fun y -> y-1) x) *) (* = fun x -> (fun y -> y+1)(x-1)) *) (* = fun x -> (x-1)+1 *) After calling add, we can't just throw away its arguments (or local variables) because those values are needed in the nested function that it returns. 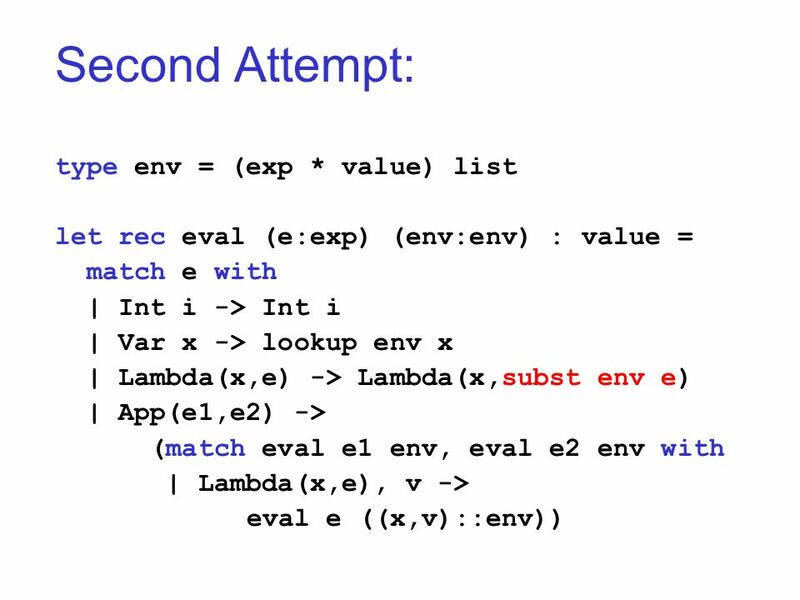 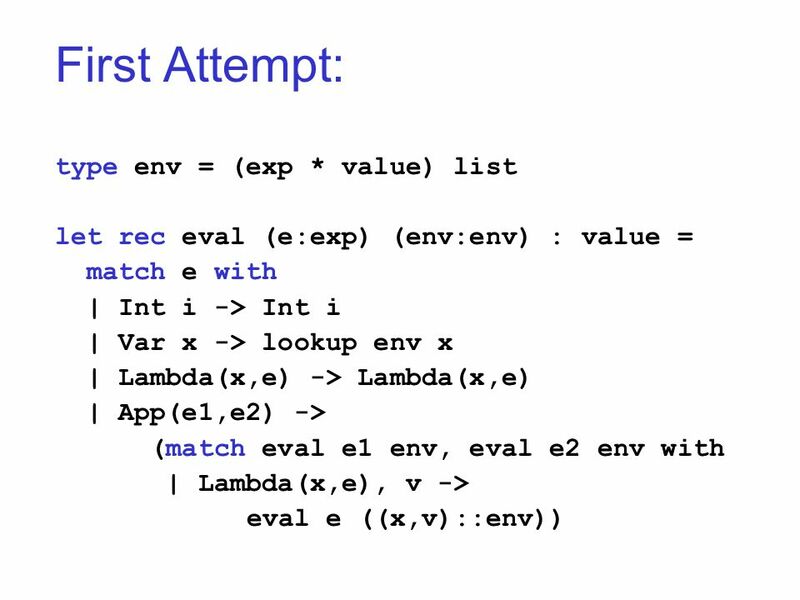 7 Problems: Eval crawls over an expression. 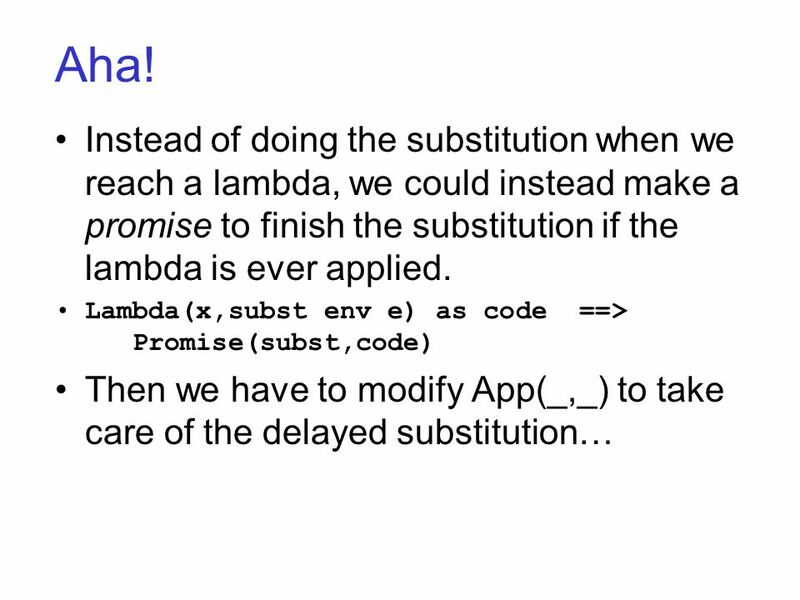 Substitute crawls over an expression. 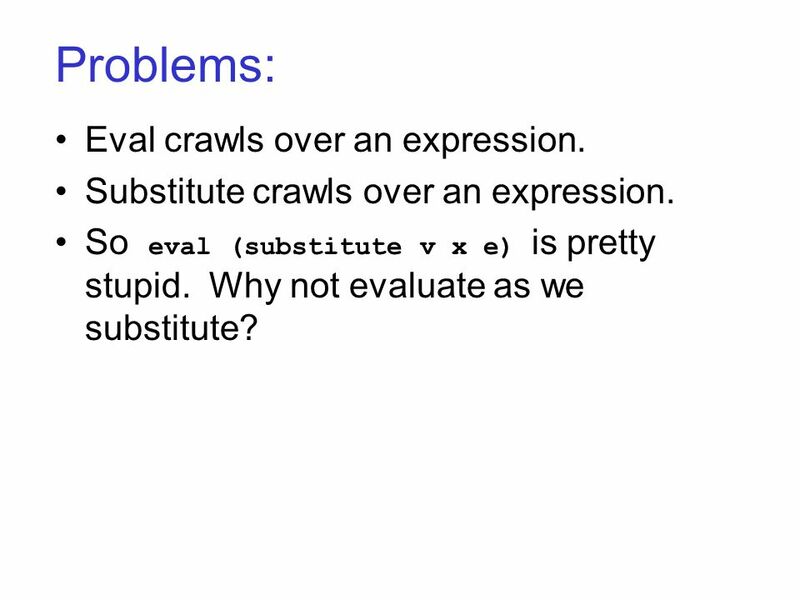 So eval (substitute v x e) is pretty stupid. 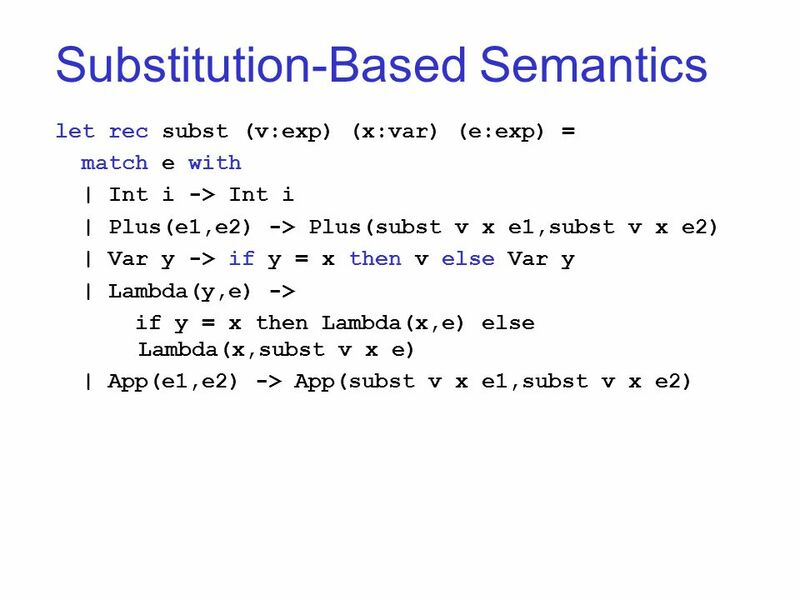 Why not evaluate as we substitute? 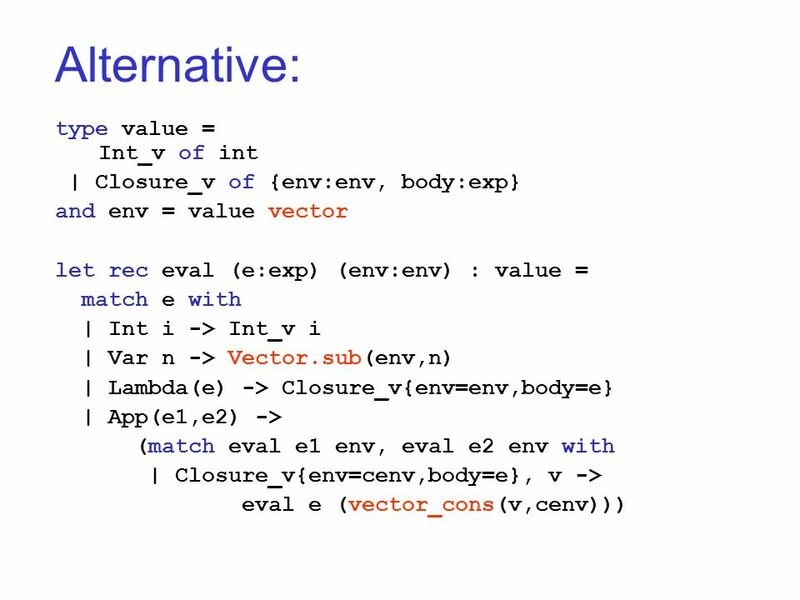 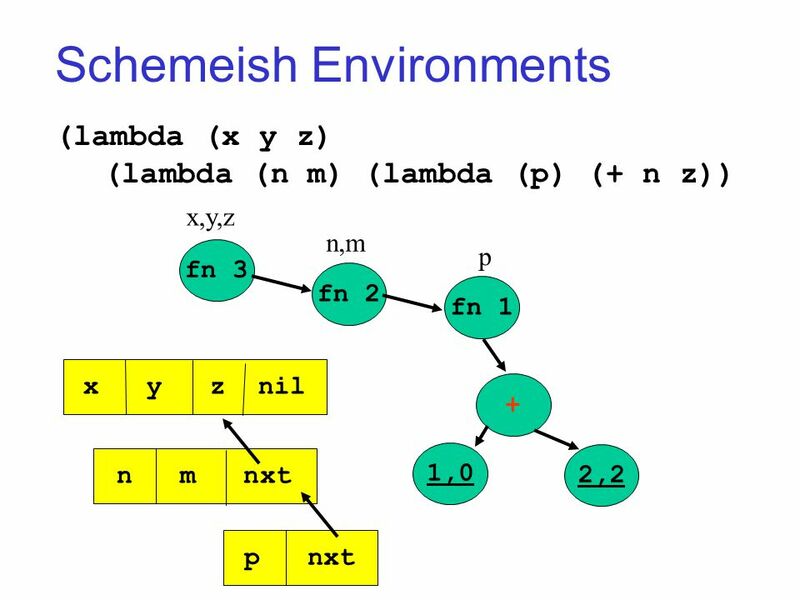 Download ppt "Closures & Environments CS153: Compilers Greg Morrisett." 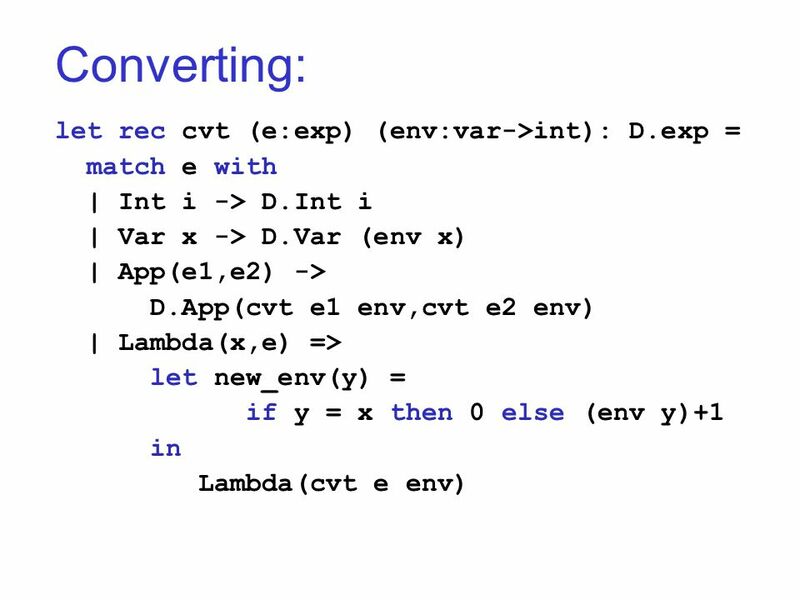 Recursive Descent Parsing (with combinators) Greg Morrisett. 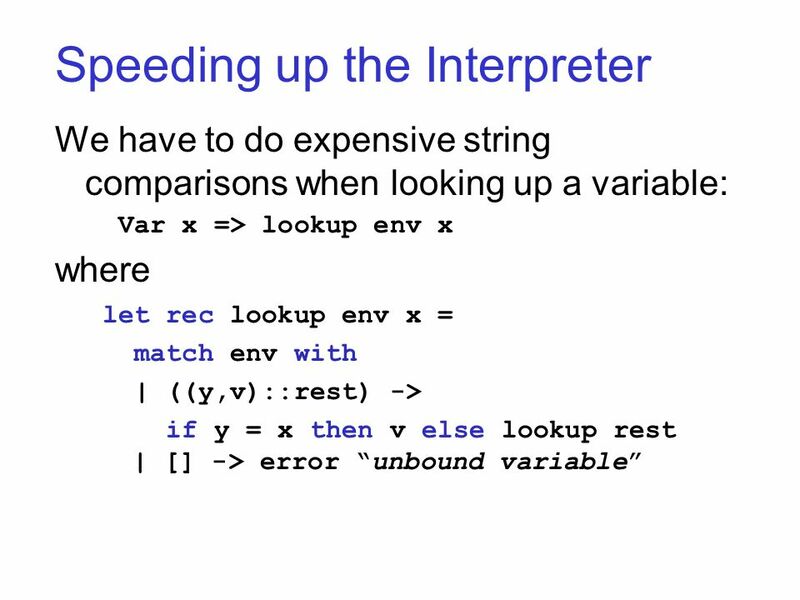 Intro to Procedures CS153: Compilers Greg Morrisett. 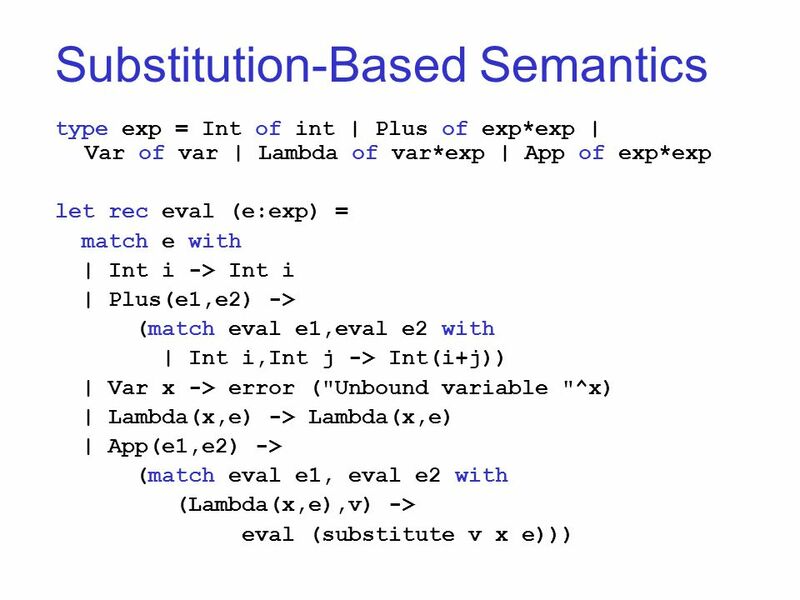 Tim Sheard Oregon Graduate Institute Lecture 8: Operational Semantics of MetaML CSE 510 Section FSC Winter 2005 Winter 2005. Algebraic Optimization CS153: Compilers Greg Morrisett. 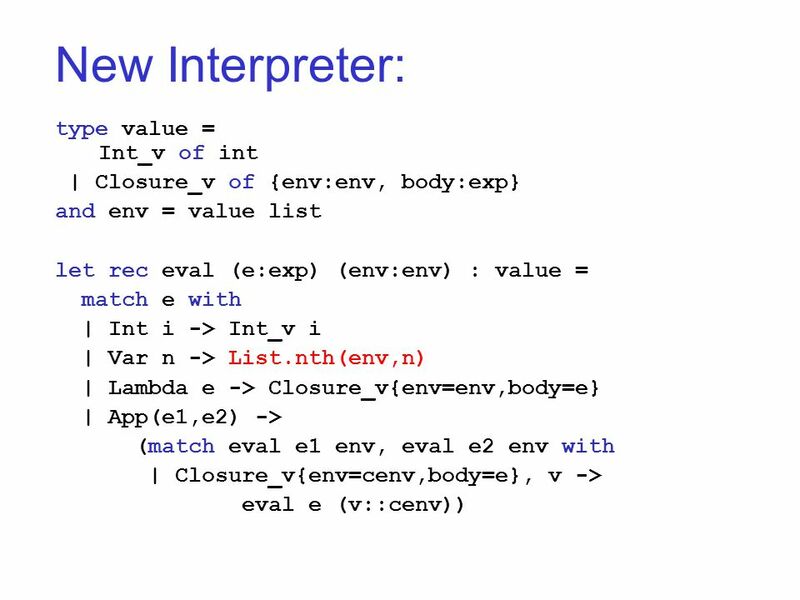 1 The metacircular evaluator Names Extend the calculator to store intermediate results as named values (define x (+ 4 5)) store result as x (+ x.
Metacircular Evaluation SICP Chapter 4 Mark Boady. 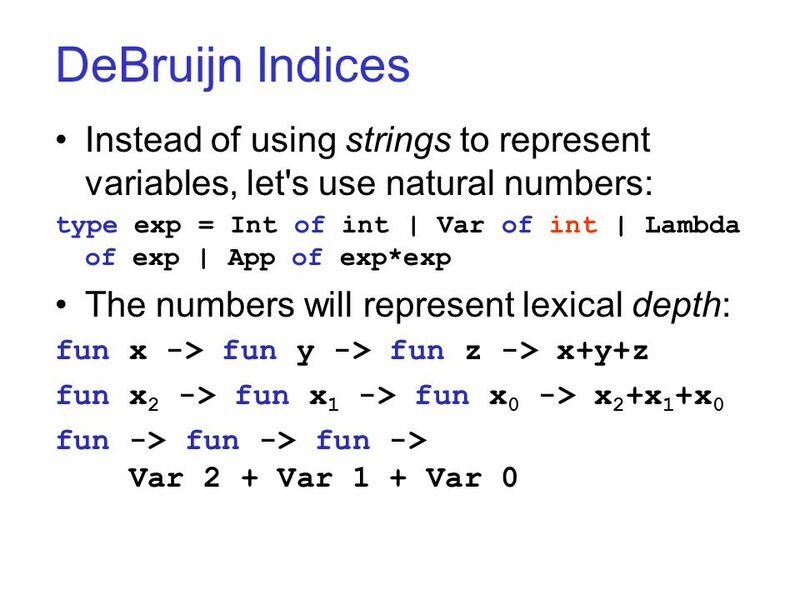 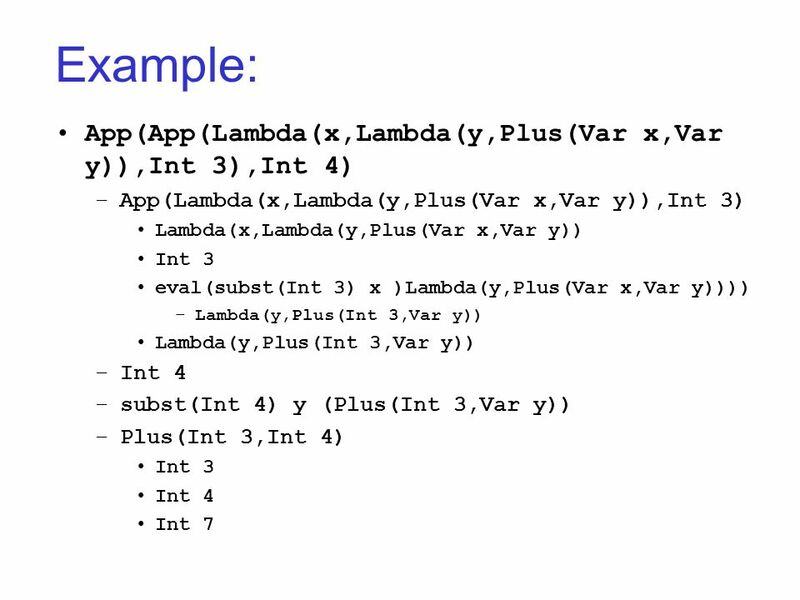 Evaluators for Functional Programming Chapter 4 1 Chapter 4 - Evaluators for Functional Programming. 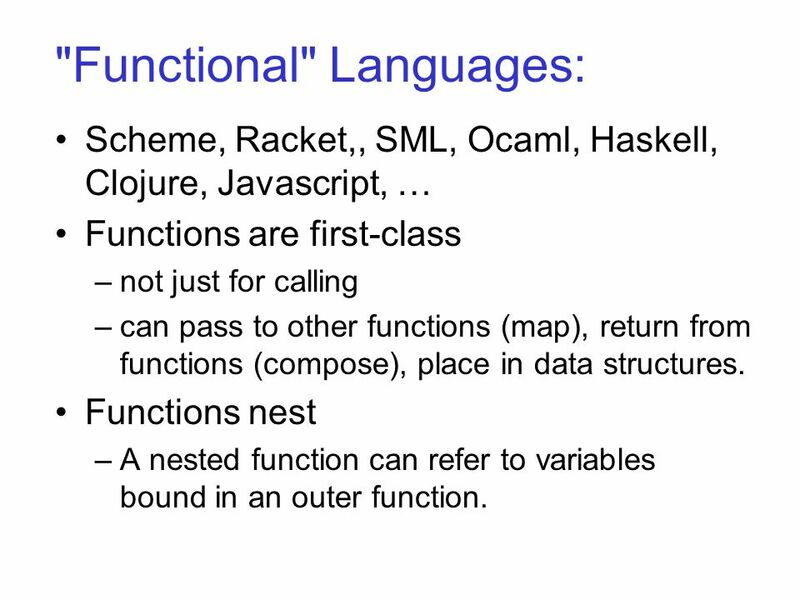 3/8/20161 Programming Languages and Compilers (CS 421) Reza Zamani Based in part on slides by Mattox Beckman, as updated.